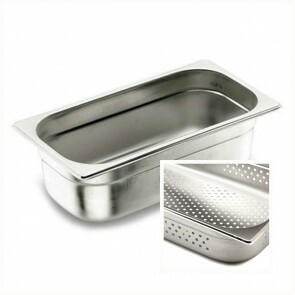 Discover our collection of gastronorm perforated containers. 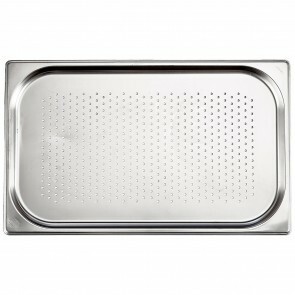 This perforated food container is perfect for steam cooking or for draining food. 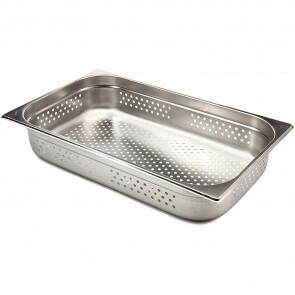 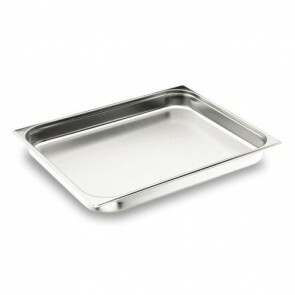 Aimed at professionals, the perforated gastronorm tray can also be used to store or refrigerate food. 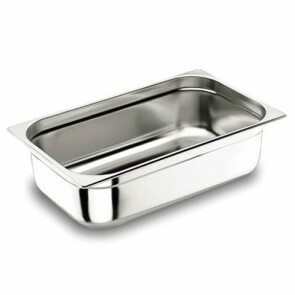 Stainless steel perforated container GN 1/1 53x 32.5 x 6.5 cm 20.8" x 12.8" x 2.4"
Stainless steel 18/10 perforated gastronorm container GN 1/2 26.5x 32.5 x 4cm/10.2" x 12.6" x 1.6"
Gastronorm - Gastronorm container GN 1/1 32,5 x 53 x 20 cm / 12.6 x 21 x 8"
Stainless steel 18/10 perforated gastronorm container GN 1/2 26.5x 32.5 x 6.5cm/10.2" x 12.6" x 2.4"
Stainless steel 18/10 perforated container GN 1/1 53x 32.5 x 2 cm 20.8" x 12.8" x 0.8"
Stainless steel perforated container GN 1/1 53x 32.5 x10 cm 20.8" x 12.8" x 4"
Stainless steel 18/10 perforated gastronorm container GN 1/2 26.5x 32.5 x 10cm/10.2" x 12.6" x 4"
Stainless steel 18/10 perforated container GN 1/1 53x 32.5 x 6.5 cm 20.8" x 12.8" x 2.4"
Stainless steel 18/10 perforated gastronorm container GN 1/2 26.5x 32.5 x 15cm/10.2" x 12.6" x 6"
Stainless steel 18/10 perforated container GN 1/1 53x 32.5 x10 cm 20.8" x 12.8" x 4"
Stainless steel gastronorm perforated container GN 2/1 53x 65 x 4 cm 20.8" x 25.5" x 1.6"
Stainless steel 18/10 perforated gastronorm container GN 1/2 26.5x 32.5 x 20cm/10.2" x 12.6" x 7.8"
Stainless steel gastronorm perforated container GN 2/1 53x 65 x 6.5 cm 20.8" x 25.5" x 2.3"
Stainless steel 18/10 perforated container GN 1/1 53x 32.5 x15 cm 20.8" x 12.8" x 6"
Stainless steel gastronorm perforated container GN 2/1 53x 65 x10 cm 20.8" x 25.5" x 4"